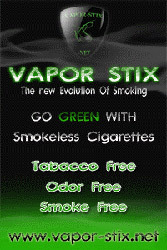 If you have an inclination to quit smoking, Jewdy & I would like to recommend a "Vapor-Stix". These are electronic cigarettes that are; Tobacco Free, Odor Free, & Smoke Free. We have both used these to quit and neither of us have had a "real" cigarette since the 1st of Feb, 2010. You will breath better and feel better! They REALLY work! Click on our Friends banner to the right for more information. If you would like to attach our banner to your site, you may use this copy.